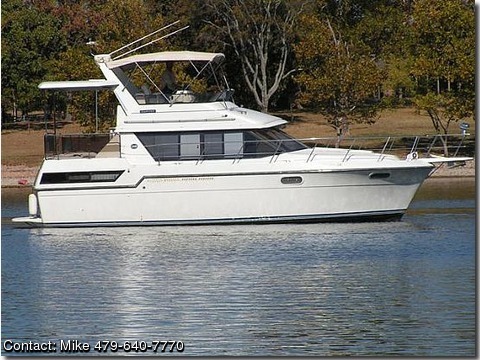 Freshwater Completely restored from inside and out new everything, enclosures, carpet, furniture, empellars, bildge pumps, generator and motors in Excellent condition, Crusader 350's, only 950 hours, raytheon electronics, new sunbrella and 40 gauges eisenglass 2006, full bridge, flybridge and aft deck complete enclosures, immaculate complete teak interior, brand new carpet throughout, 3 reverse cycle ac heat and generator, boat safe heater for engine compartments included, Builder/Designer builder-Chris Craft Catalina 372 Dimensions OAL 44ft, displacement 16800, 2 crusader engines 270hp 350hours, 800 cruising speed 16 max speed 28, fuel gas 250, water 100, waste 40, Accomodations- sleeps 8 in 2 staterooms, vanity in master queen stateroom, V berth full size stateroom, dinette seats 4, sleeps 2, electric master head w/ separate shower, electric guest head w. included shower, New Futon sleeps 1-2 in salon and a Wet Bar & Teak Bistro set on hard covered aft deck, w/ u line icemaker in wet bar, 3/4 size norcold refrigerator w/ freezer in galley, large custom pantry in galley, Haier microwave in galley, princess 3 burner electric stove, double Stainless sink, water heater, new pressure water pump, dock water adapter, navigation and electronics, autopilot, ritchie compass, standard horizon eclipse vhf, datamarine 2490 dart speed/log/temp.depth, raytheon RL 425 chart plotter/gps, furuno 1751 radar, am/fm stereo, Windlass anchor, 10ft chain, 150ft rope, bow pulpit, 4 dock lines, 8 fenders, fender holders on bow rail, radar arch, nav lights, searchlight w/ remote, swim platform, swim ladder w/ privacy cover, large aft deck screen, splash guards mechanical, 3 marine air reverse cycle ac/heat, 2 bilge blowers, 3 bilge pumps, engine alarms, fuel shutoff, holding tank, head pumpout, sea strainers, tachometers, bennett trim tabs electrical system, 6 batteries, battery charger, Onan 6.5kw generator, shower power dual 30/125, select switch, 2 power cords safety equip, flare kit, xintex M-1 fume detector, 3 manual fire extinguishers, 1 life ring, bottom paint, manuals and more.Compare price at $89k plus very rare freswater. Hull and outwide of boat is immaculate condition. boat looks and runs like brand new.